This page concerns one of the crew members of submarine E-47. It is mentioned on this page that the wreck was found, but does not report further details. I want to let you know that I was the person that managed to identify the wreck of E-47. Attached you will find the letter I wrote to the Naval Historical Branch of the Royal Navy, which also tells how. Past two years we, wreckdivers of Divingteam Noordkaap from the island Vlieland in the north of the Netherlands, made several surveys on a wreck of a British WW I submarine. This wreck lies in the Northsea about six nautical miles northwest of the Frisian Island Texel. This wreck was discovered several years ago, but there were no clues as to the identity of this wreck. Observations on the wreck made clear it was a Royal Navy E-type submarine. Last year the deckgun, which was torn off of its fundaments probably by a trawler and which was lying beside the wreck, was salvaged by Divingteam Ecuador from Terschelling. The number of this 12 pdr. 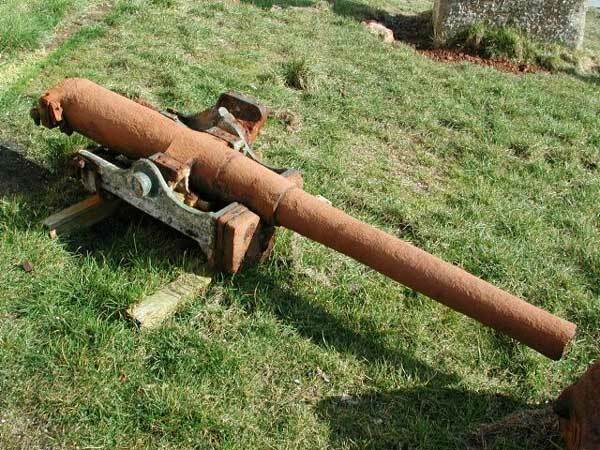 8 cwt Quick Firing gun, engraved in the bronze screw breech, is 1641. A total of 26 E-type Royal Navy submarines were lost during WW I, 13 of these are reported; Lost in the Northsea. With this, I think, its save to say that the wreck that bears the Dutch Hydrographic Department wrecknumber 927, and which lies in position 53 06 810 N and 04 33 280, is that of HMS E47. Observations on the wreck give the impression that E47 has hit a mine. The remains of the hull show a large hole at the portside of the control-room section. The bow lies in an easterly direction, wich might say E47 was still on it’s way to it’s patrol area. 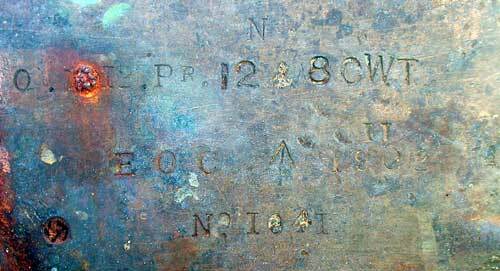 You can add this information to your file on HMS E47. I might be of use for now or in the future. To my surprise I did not receive an answer, nor a confirmation of receipt, to my letter. I also noticed that the official website e.g. the one from the Submarine Museum do not report the finding and identification of the wreck. However, new laws on this matter are only active in British waters, so Dutch divers, diving in Dutch waters do not break any law when they dive on the wreck of a Royal Navy vessels lying in Dutch waters. A consequence of the position of the Royal Navy is that people interested in this matter do not get informed. Through other channels I had contact with at least one relative of one of the crew members of E-47, and through your website it becomes clear that more people are interested in the fate of this submarine. Maybe you can put this letter on your site, and I would be very happy to inform others interested in the wreck of E-47. Knowing E-47 is lying close to the island I live on, I now gather information on this submarine and its crew members. On your site details are given on the Lieutenant Colin Francis Creswell RN. This was very welcome for my file I have on E-47. I would like to obtain a photo of Lt. Creswell, maybe you, or the readers of your weblog can be of assistance in obtaining this. A photo, and the details of Colin Francis Creswell, will be used in a presentation in our local historical museum in which we have a section about shipwrecks, strandings and ship disasters on, and close to our coast. Thank you for your fascinating message, we will add those details to Ahoy. I am sorry but I cannot find a photo of Colin Creswell anywhere, but am still trying some Australian contacts. I will be in touch again should I succeed. I would appreciate your assistance in trying to find a photo of Colin Creswell, maybe the readers of your weblog might also be of help. I have attached two photo's of the deckgun of E-47, maybe you can add these to my contribution to Ahoy. Please be so kind to correct some spelling mistakes in my first email before you add them to your site. I did noticed them after I transmitted my message, and find them a bit bothering.